The two-round system is used around the world for the election of legislative bodies and directly elected presidents. For example, it is used in French presidential, legislative, and departmental elections. In Italy, it is used to elect mayors, but also to decide which party or coalition receives a majority bonus in city councils. A two-round system is used also to elect the presidents of Afghanistan, Argentina, Austria, Benin, Brazil, Bulgaria, Burkina Faso, Cape Verde, Chile, Colombia, Costa Rica, Croatia, Czech Republic, Cyprus, Dominican Republic, East Timor, Ecuador, Egypt, El Salvador, Finland, Ghana, Guatemala, Haiti, India, Indonesia, Kyrgyzstan, Liberia, North Macedonia, Peru, Poland, Portugal, Romania, Russia, Senegal, Serbia, Slovakia, Slovenia, Turkey, Ukraine, Uruguay and Zimbabwe. Historically it was used to elect the Reichstag in the German Empire between 1871 and 1918, and in New Zealand in the 1908 and 1911 elections. 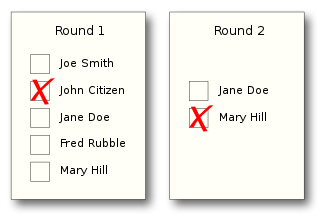 Since the voters in the two-round system don't have to choose their second round votes while voting in the first round, they are able to adjust their votes as players in a game. More complex models consider voter behavior when the voters reach a game-theoretical equilibrium from which they have no incentive, as defined by their internal preferences, to further change their behavior. However, because these equilibria are complex, only partial results are known. With respect to the voters' internal preferences, the two-round system passes the majority criterion in this model, as a majority can always coordinate to elect their preferred candidate. Also, in the case of three candidates or less and a robust political equilibrium,  the two-round system will pick the Condorcet winner whenever there is one, which is not the case in the Contingent vote model. Runoff voting is intended to reduce the potential for eliminating "wasted" votes by tactical voting. Under the " first past the post" (plurality) method voters are encouraged to vote tactically by voting for only one of the two leading candidates, because a vote for any other candidate will not affect the result. Under runoff voting this tactic, known as "compromising", is sometimes unnecessary because, even if a voter's favourite candidate is eliminated in the first round, they will still have an opportunity to influence the result of the election by voting for a more popular candidate in the second round. However the tactic of compromising can still be used in runoff voting because it is sometimes necessary to compromise as a way of influencing which two candidates will survive to the second round. In order to do this it is necessary to vote for one of the three leading candidates in the first round, just as in an election held under the plurality method it is necessary to vote for one of the two leading candidates. Runoff voting is also vulnerable to another tactic called "push over". [ citation needed] This is a tactic by which voters vote tactically for an unpopular "push over" candidate in the first round as a way of helping their true favourite candidate win in the second round. The purpose of voting for the "push over", in theory, is to ensure that it is this weak candidate, rather than a stronger rival, who survives to challenge a one's preferred candidate in the second round. But in practice, such a tactic may prove counter-productive. If so many voters give their first preferences to the "weak" candidate that it ends up winning the first round, it is highly likely they will gain enough campaign momentum to have a strong chance of winning the runoff, too, and with it, the election. At the very least, their opponent would have to start taking the so-called "weak" candidate seriously, particularly if the runoff follows quickly after the first round. Runoff voting can be influenced by strategic nomination; this is where candidates and political factions influence the result of an election by either nominating extra candidates or withdrawing a candidate who would otherwise have stood. Runoff voting is vulnerable to strategic nomination for the same reasons that it is open to the voting tactic of "compromising". This is because a candidate who knows they are unlikely to win can ensure that another candidate they support makes it to the second round by withdrawing from the race before the first round occurs, or by never choosing to stand in the first place. By withdrawing candidates a political faction can avoid the " spoiler effect", whereby a candidate "splits the vote" of its supporters. A famous example of this spoiler effect occurred in the 2002 French presidential election, when so many left-wing candidates stood in the first round that all of them were eliminated and two right-wing candidates advanced to the second round. Conversely, an important faction may have an interest in helping fund the campaign of smaller factions with a very different political agenda, so that these smaller parties end up weakening their own agenda. Critics argue[ who?] that the absolute majority obtained by the winner of runoff voting is an artificial one. Instant-runoff voting and the exhaustive ballot are two other voting methods that create an absolute majority for one candidate by eliminating weaker candidates over multiple rounds. However, in cases where there are three or more strong candidates, runoff voting will sometimes produce an absolute majority for a different winner than the candidate elected by the other two. Advocates of Condorcet methods argue[ citation needed] that a candidate can claim to have majority support only if they are the "Condorcet winner" – that is, the candidate who would beat every other candidate in a series of one-on-one elections. In runoff voting the winning candidate is only matched, one-on-one, with one of the other candidates. When a Condorcet winner exists, he or she does not necessarily win a runoff election due to insufficient support in the first round. Runoff advocates counter[ citation needed] that voters' first preference is more important than lower preferences because that is where voters are putting the most effort of decision and that, unlike Condorcet methods, runoffs require a high showing among the full field of choices in addition to a strong showing in the final head-to-head competition. Condorcet methods can allow candidates to win who have minimal first-choice support and can win largely on the compromise appeal of being ranked second or third by more voters. One of the strongest criticisms against the two-round voting system is the cost required to conduct two ballots. The two-round voting system also has the potential to cause political instability between the two rounds of voting, adding further to the economic impact of the two-round electoral system. Under an instant run-off ballot method there is only one round. It is alleged[ by whom?] that the results of the election are known in days as opposed to months depending on the size of the electorate, but this is not always the case depending on the ability to count the rounds of the more complex instant runoff voting.